One pot meals make for quick, easy, and affordable cooking. 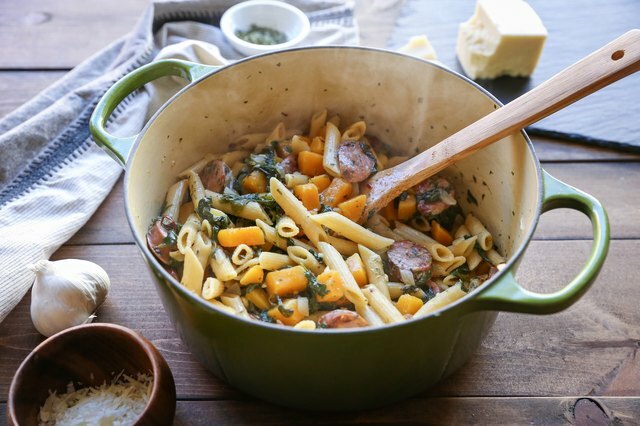 This One Pot Butternut Squash and Sausage Pasta recipe uses a minimal amount of basic ingredients and only requires about 30 minutes of cook time. 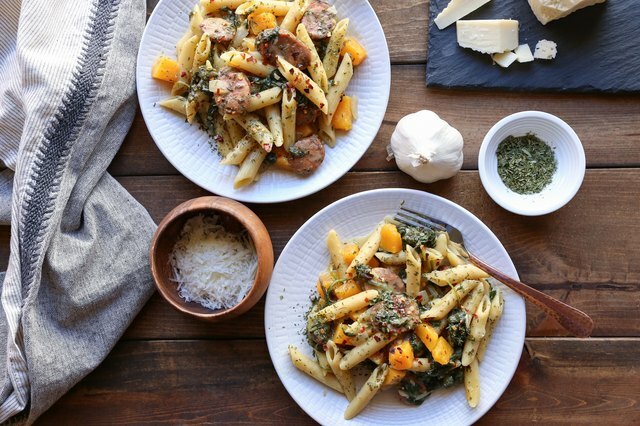 For a comforting yet healthful meal, this pasta is a real winner! Be sure to use pre-cooked sausage to keep the recipe simple and also eliminate any need for another pan for cooking. Use any type of cheese in this recipe - Parmesan, Gruyere, or Gouda are recommended. Replace the butternut squash with any winter squash or even sweet potato. Make this recipe gluten-free by using gluten-free penne noodles. Heat the olive oil in a large pot over medium-high, and add the chopped onion. Saute, stirring frequently, until translucent, about 5 minutes. Add the butternut squash and garlic and cover. Continue cooking, stirring occasionally for 3 minutes. Add the broth, white wine, Italian seasoning and sea salt to the pot with the veggies and bring to a full boil. Add the pasta and return to a boil. Cook uncovered, stirring occasionally, until most of the liquid is absorbed, about 12 to 14 minutes. Once much of the liquid has been absorbed by the noodles, add the spinach and sliced pre-cooked sausage, and gently stir into the pasta until wilted. 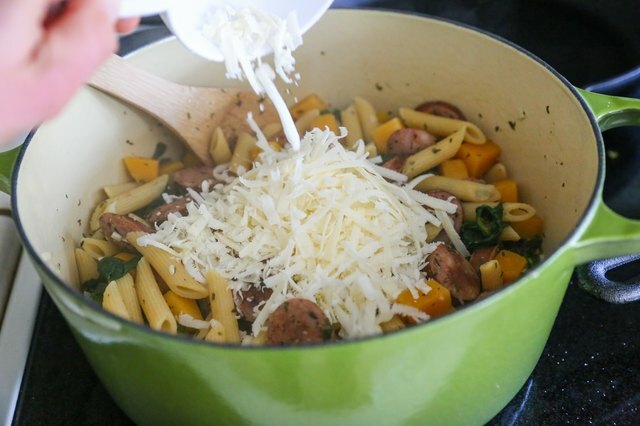 Add the grated cheese and gently stir into the pasta until the cheese has melted and a thick, creamy sauce results. Taste the pasta for flavor and if necessary, add more sea salt and any fresh herbs if desired. Serve heaping plates with freshly grated Parmesan and enjoy.